Genuine Fender® '57 vintage Stratocaster® black pearl (Moto), 4 ply, 8 hole pickguard for three single coil pickups. Fits '57 American vintage, SRV and Eric Clapton Stratocasters (USA) '50s Stratocaster® (Mexico). Accepts Phillips oval head pickup and selector switch mounting screws. 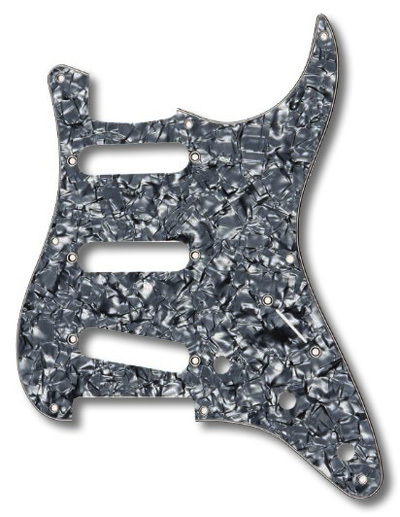 This pickguard does not have any shielding as it comes to us from Fender, you should consider including item # 001-9640-000 for the '50s period specific type of shielding to your order, or for a full coverage type of shielding use item # 001-9699-049 to fully shield your pickguard. However, the 001-9699-049 shield would need two of its perimeter mounting holes drilled/adjusted to mount accurately with this vintage 8 hole pickguard.